Crona uses this word to describe her confusion when interacting with certain things or her inability to respond to things in a certain way. When she sees something she's never seen before, she says that she "doesn't know how to deal with it." (どう接したらいいか分からないよ) When she's asked to kill an animal, she freezes and says that she "can't interact that way." (そんな接し方できないよ) When she's confronted by someone who challenges her to battle and won't give up, she becomes frustrated and asks them to stop because she doesn't know how to "interact" with them. (接し方が分からないよ) She even speaks about how she has trouble "interacting with her ribs" because she's so thin. (これ以上痩せたらあぱらのどう接したらいいのか分からないよ!) I counted at least 11 times that Crona says the word, from episodes 7, 8, 16, 20 and 21. 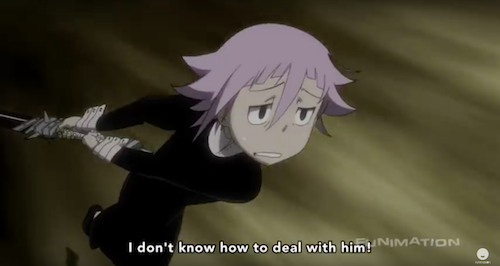 The word shows how Crona struggles to understand how to deal with things. As she moves about the world and encounters various people, things, and circumstances, she finds that she's at a loss for knowing what to do. How should she handle them? How should she respond? How should she react? At times, these are simply new experiences and she really doesn't know what she should do. Other times, she's told to respond with a certain action, but she feels like she simply can't. She knows what she must do, but...she can't. That tension of needing-to-but-not-being-able-to is a feeling that I can relate to. Also, the idea of passing through the world and encountering these things, bumping into them like geometric shapes on a mathematical plane - that's how life can feel to me oftentimes. Even if the people and things are not physically touching me, I still feel jostled, pushed, and squashed by them in a very real way. In that way, my anxiety isn't just a made up feeling - it's a tangible experience from the sessuru of actual things in my life. Not so much from fearing possibilities, but from the actual encounters that they have with me, when their borders brush up against mine. I'm glad to have a word that expresses that experience, even if it is a word in another language.